Mentor can be defined as a trusted counselor or guide. In other words, this mentor could be refer to someone whom you gain knowledge or idea that benefited you to bring it along with your life as you move forward for your future. It is such a fortunate enough to meet a caring adult whose advice, guidance, and example made a difference. Ask yourself today if there is someone who gave you an important lesson that changes everything in you. I’ve been reading a book this past few days and yet I haven’t finished it, , I would give you a glimpse of this book called “A person who changed my life”. 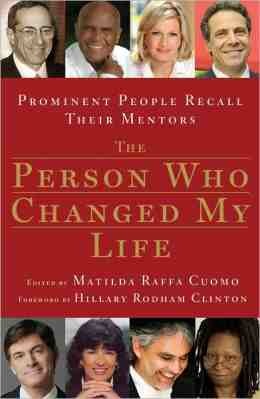 This book was edited by Matilda Raffa Cuomo and foreword by a great woman herself, Hillary Rodham Clinton. This book was a collection of essay came from the prominent people who recall their mentors that changed their life forever. This book contains more or less 70 people who tells their story about their mentor whom they thankful for. This book is a very wonderful one since it gives an inspiring stories coming all the way from the people who are now known today. If you are looking for a book that will inspire you, try and read this book.